The trout, not to mention grayling, season seems a long way off. Tomorrow is forecast to be the coldest day of the winter, with the temperature in the Sudeten mountains dropping to minus 30 degrees. Yuck. Is there a better way to warm up to the coming season than by tying a few #16 olives? The 2015 fishing season was a tricky one to me. The warmest and driest summer and autumn on record had unfortunate, if not entirely unexpected, impact on the Czech trout & grayling fishing. Add to that some family obligations and the result to me was the lowest catch since I started taking notes a long way back. But not all is lost: hopefully a wet winter is in the making, which should lay strong foundations for a good next year's water levels (they could hardly get any worse) and my lovely daughter is fast approaching the age when she can be safely introduced to the joys of fishing. So to all of my blog readers: have a nice, productive and happy season 2016! The dry heat of summer is past, and not too missed. 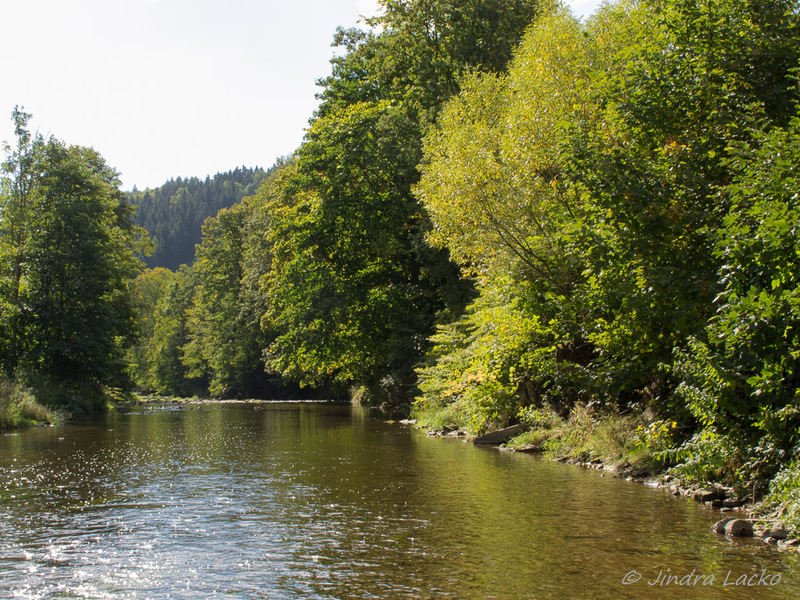 Czech rivers are slowly - very slowly - recovering from this year's drought. 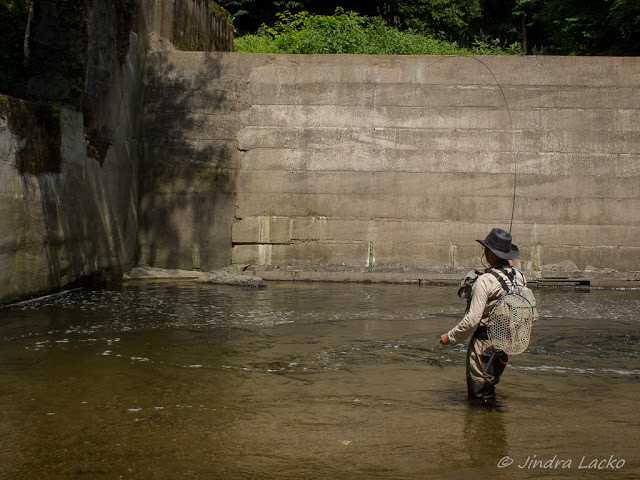 On many rivers the trout population will take years to recover. 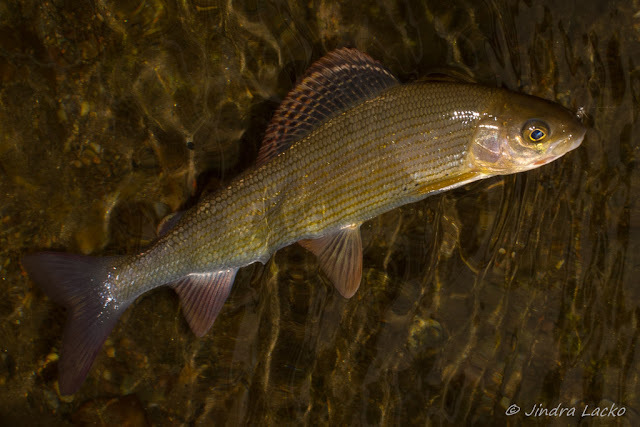 But despite all that - the grayling season is finally upon us. 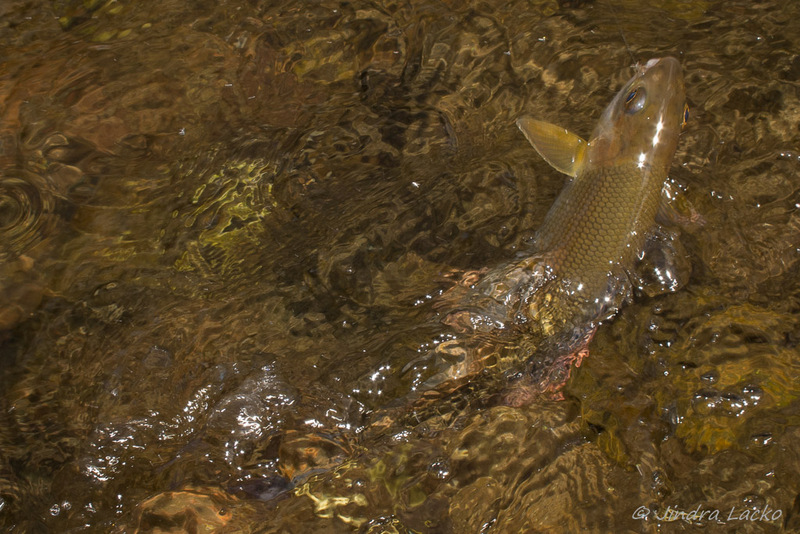 To celebrate the start of my favorite fishing time of the year I travelled to Úpa, a reliable grayling performer. The river was still a bit warm, and low, for my liking. 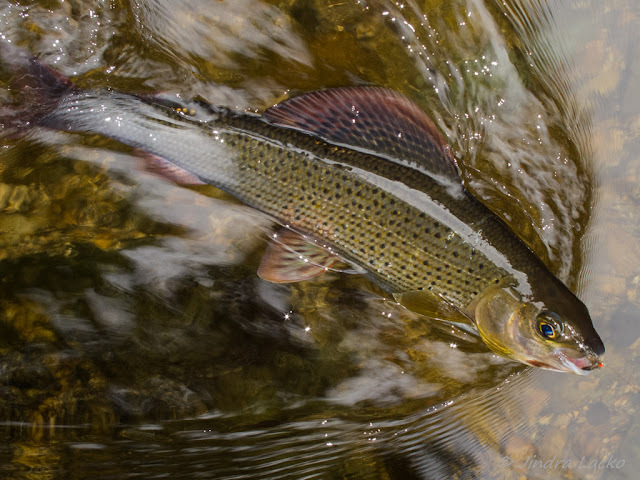 The grayling were present though, and even if they were not in the perfect condition yet they were active and approached my flies with interest. The fish were moody & picky, as is about to be expected from grayling, and during the day switched their attention several times from nymphs to dries and back. As the river was very low the fish were - by necessity - in clear and shallow water. Heavily weighted nymphs were therefore not required, and I had good sport with my bloodworm fly. A few years back I somehow acquired a package of #10 Partridge Klinkhamer hooks. These hooks are meant for the famous Klinkhåmer special fly by Hans van Klinken. I fish the "klink" style flies gladly and often, but I yet have to travel to the famous Scandinavian waters for which the original Klinkhåmer was designed. The grayling in the Arctic regions are supposed to take a size #6 dry fly freely... Those on the rivers I normaly fish will frown on any dry flies bigger than #16 (perhaps taking an occasional #14 in the high summer, but firmly focusing on size #18 or so flies in the grayling season proper). 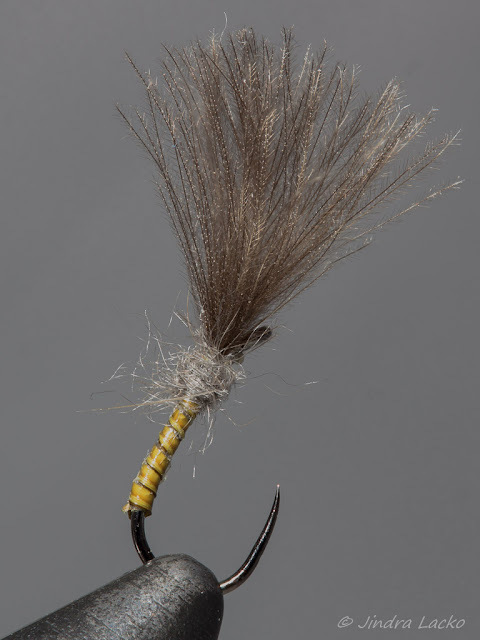 However, having decided that the hooks are too big for a decent dry fly and abandoning them for some time, I was struck with an idea: why not use them for a nymph? Grayling can be picky about big dries, but they do appreciate a juicy nymph or two. With this revelation I tried them on the most simple fly pattern I know: The Bloodworm. 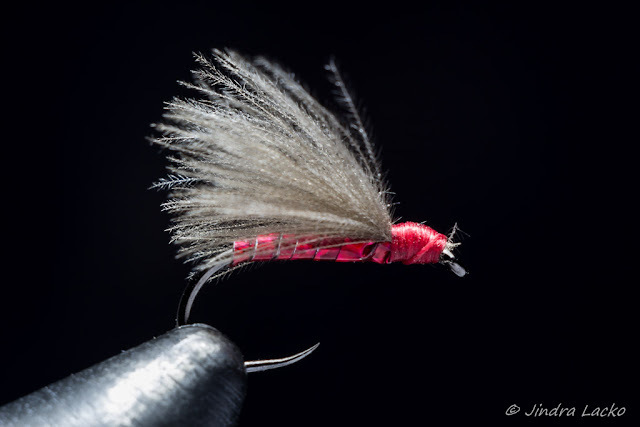 A simple fly it may be - the dressing consists of only two materials (a thread and a floss) + some lacquer - but it is one of the most deadly subsurface grayling flies that I know. 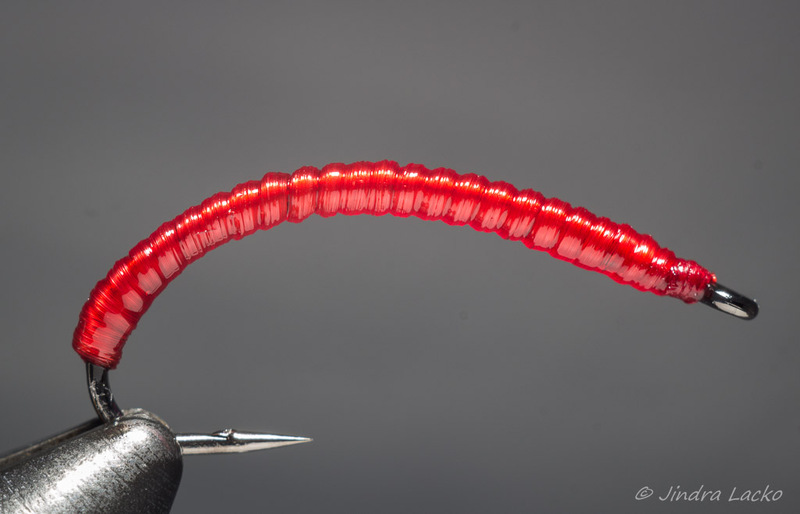 A recent discussion on a respected fly dressing forum made me think hard about the unconscious choices I make when selecting hooks for my imitations. I like my flies to be roughly equal to the size of the insect being imitated, or slightly above (I subscribe to the supernormal stimuli school of imitation). In river fishing it usually means tying mayfly imitations on sizes # 14 - #18, and caddisfly ones somewhat larger. 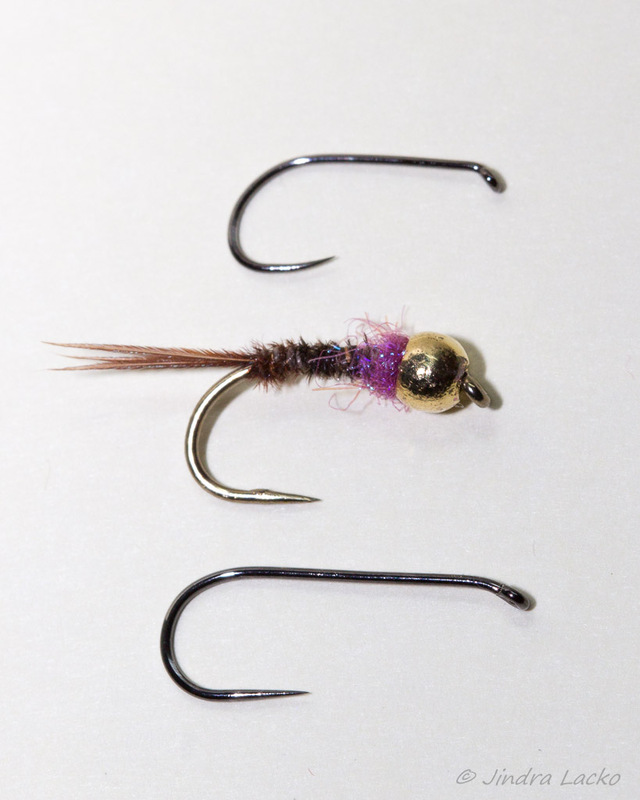 On the other hand I am really fond of Kamasan B160 hooks in size #10. They are sharp, reliable and can be had in a handy & economical package of 100 hooks. Size #10 should be a tad big for regular river fishing though. 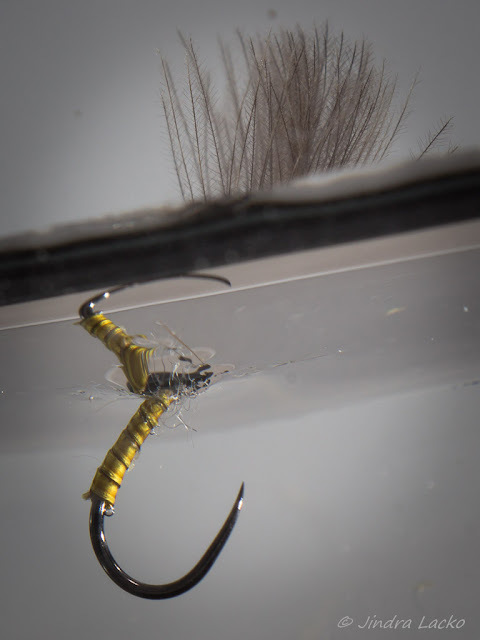 The trick is that the B160's are 3x short hooks, which means that they are about the size of regular #14 hooks. About right for most river fishing. The picture shows a #14 Hanák H130 BL hook (my favorite dry fly hook), a fly tied on a Kamasan B160 in size #10 and a regular size #10 dry fly hook - a Hanák H100 BL, as I could not find a properly sized H130 BL fast enough. The moral of the story is that while manufacturer labels of hook sizes and shapes and whatever are important you should not trust them too much - your own judgement matters much more! As the fans of the fantasy writer George R. R. Martin are no doubt aware, Autumn is coming! Given the sorry state of Czech rivers this is welcome news, even if the current (still rather) hot weather makes it hard to believe. After the hottest and driest summer in recent memory we are looking forward to some cooling off. 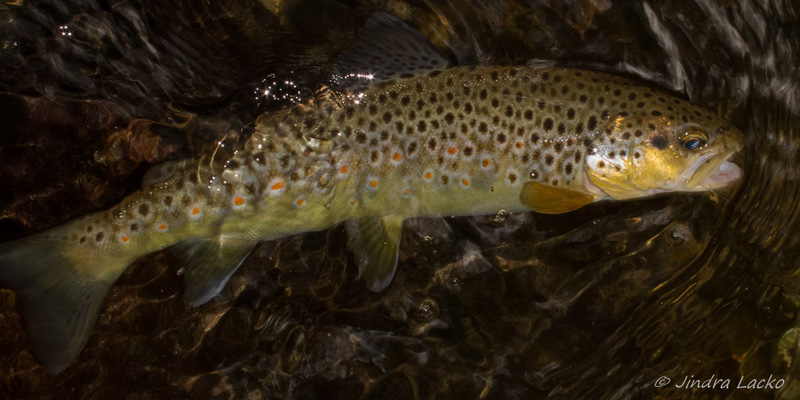 The trout stocks took a hard beating, with the hot weather delivering a double whammy of low water and low oxygen. The grayling are said to have taken it better, but I have not fished for them since the early July and so I can not confirm it from the first hand. As I waited for the weather to calm down I did some experimenting with presentation and imitation. The question on hand was the difference in how the fly dresser (i.e. me :) sees his emerger fly and how a fish looks at the same subject. I have acted as a host to my French friend Philippe & his charming wife on their visit to the Czech Republic. Besides guiding them to the usual tourist traps such as the Prague castle and the Jewish quarter we had some serious fun fishing. 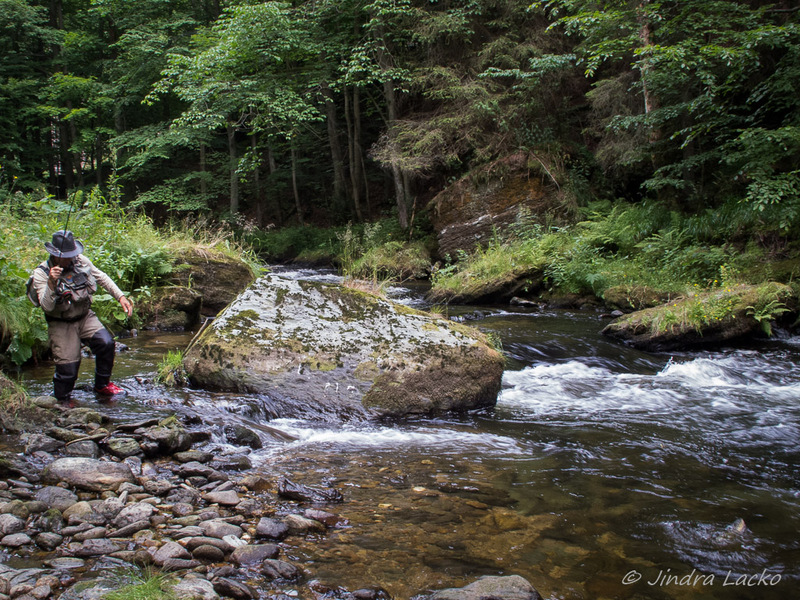 The deep canyon of Kamenice provided a welcome respite from the high summer heat. 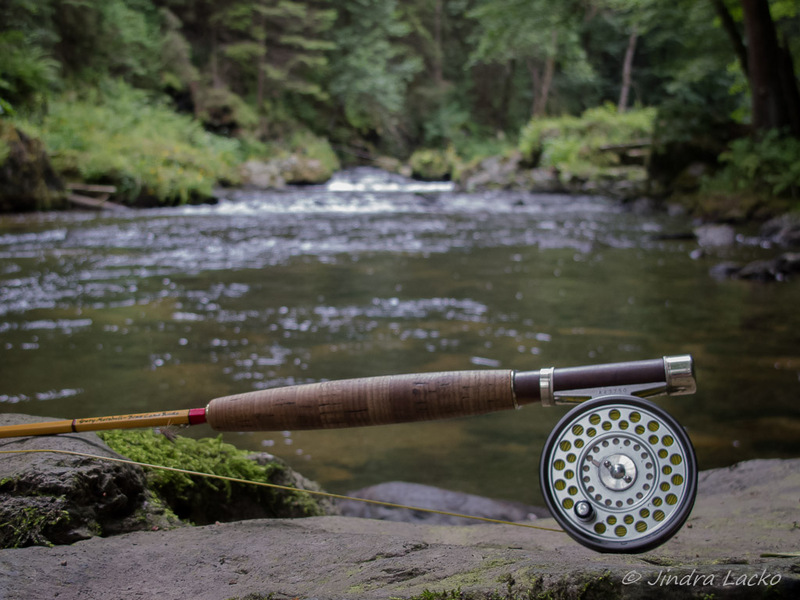 Philippe - also called by those in the know the Heron of Palladuc - is one of the few fly fishermen who are able to turn their passion into a full time profession, and as result gets significantly more stream time than a humble accountant like me. I was glad to be able to learn a few of his tricks. We set up for the day with me fishing the dry fly on a short classical rod and Phil fishing the nymph with a 10' 3 weight nymphing special. The character of the river - with alternating deep pools, more suited for nymph, and shallow riffles with an occasional rising fish - made the split easy and we were able to keep in touch, not getting under each other's feet. Phil had the more success of the two of us, and while we did not see it necessary to keep an accurate tally of fish caught, must have ended the day somewhere around the 50 fish mark. He clearly demonstrated why the Yo-yo technique (an indicator dry fly approach, close to the New Zealand combo) is outlawed in competition fly fishing circles. It is so effective it borders on the criminal. We caught a number of fish, both brown trout and grayling. And while only few of the fish passed the 30 centimeter mark - the character of the river being such that the theoretical maximum size of fish it can support is 40 centimeters, and those will be rare and few between - all the fish were native and in good condition. We did not encounter recently stocked fish, with not a single brook trout or a rainbow between the two of us. On the dry fly front I had the most success with size #16 Redheaded Emerger, although I suspect that any caddis fly imitation in the general size and shape would perform as well. A large number of caddis were hatching during the day, and the fish did not seem to be too preocupied by the fly pattern - the stealthy approach (river was low and gin clear) and accurate presentation seemed to matter much more than the fly choice. Z muchą tu i tam. All in a day’s tying…. © Jindra Lacko 2009 - 2016. Awesome Inc. theme. Powered by Blogger.